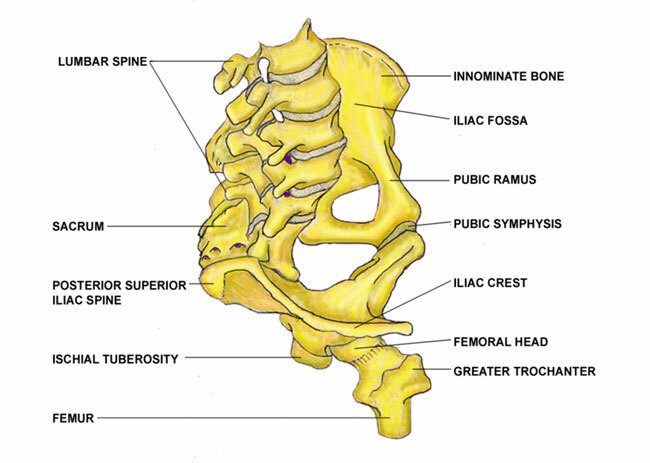 The pelvic ring is composed of two innominate bones and the sacrum. 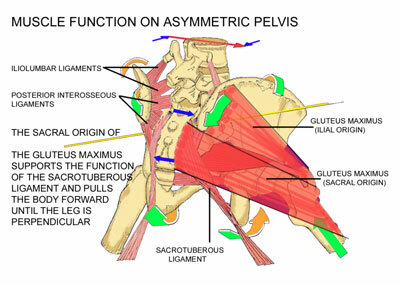 The innervation to the sacroiliac joints is highly variable and complex. Pain may be referred in a sclerotomal fashion. Adjacent structures may be affected by intrinsic joint pathology and become active nociceptors. Pain referral patterns may be dependent on the distinct locations of injury to the sacroiliac joint. The anterior portion of the sacroiliac joint receives innervation from the posterior rami of the L2-S2 roots, but these contributions are highly variable and may differ in the joints of a given individual. Additional innervation to the anterior joint may arise directly from the obturator nerve, the superior gluteal nerve, and the lumbosacral trunk. The posterior portion of the joint is innervated by the posterior rami of L4-S3. An additional autonomic component of the innervation to the sacroiliac joint further increases the complexity of its neural supply and likely adds to the variability of the pain referral patterns. The sciatic nerve passes immediately beneath or traverses through the piriformis and may become irritated by spasm of the piriformis. 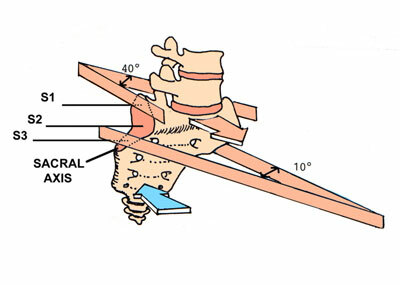 The unique shape of the joint is essential to normal function. 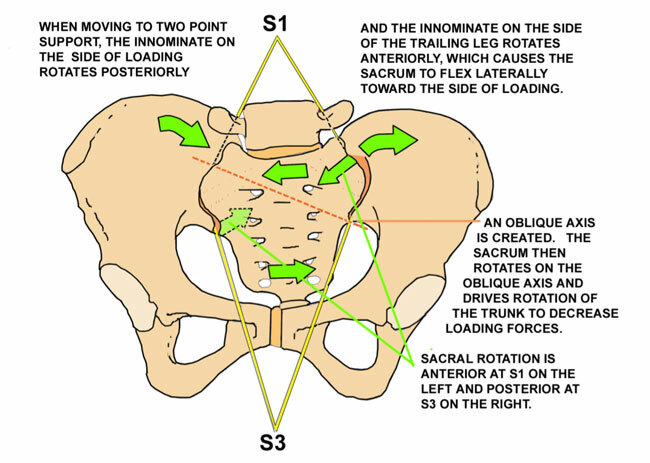 Loading is anterior and takes place on a sacral axis at the most posterior part of the S3 sacral segment of the sacroiliac joint. Note the shape at S1 and how it is prone to 'fall away' from the ilial joint surface with ligamentous loading. 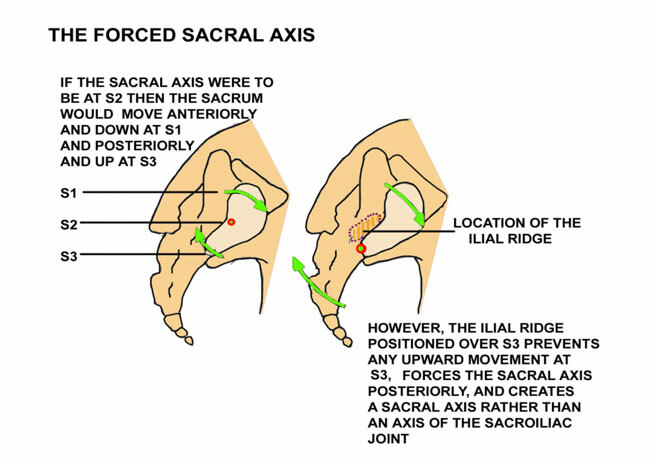 The ilial ridge just cephalad to the S3 sacral segment prevents any cephalic movement at S3 and forces the location of the axis to the posterior aspect of S3. A bony transition point at that location has been verified by Gracovetsky. 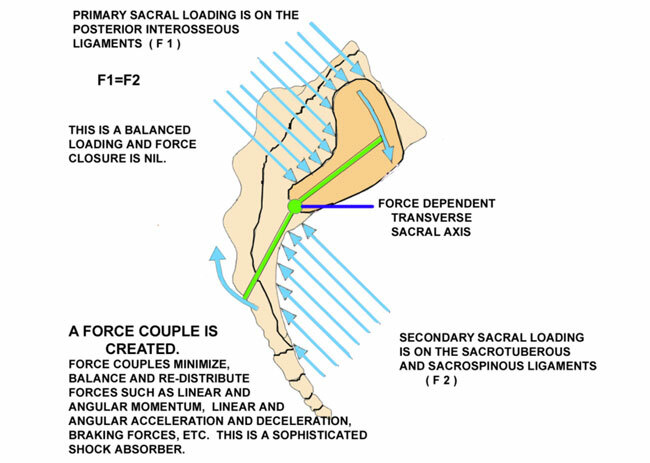 Primary sacral loading is on the posterior interosseous ligaments. Secondary loading is on the sacrotuberous and sacrospinous ligaments. The secondary loading will equal, but cannot exceed the primary loading. Sacral loading increases the lumbar lordosis and the lumbosacral angle. 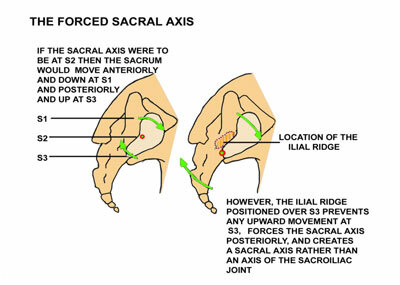 The ilial ridge forces the sacral axis by not allowing any cephalic movement of the sacrum on the innominate bone or any normal or pathological caudad movement of the innominate bone on the sacrum. Posterior rotation of the innominate on the sacrum can only occur with correction when the joint is already in dysfunction. Vleeming described form closure, force closure and self-bracing in the sacroiliac joint, but this can only occur in the unloaded pelvis or in the pelvis of the fresh cadaver. WHEN THE JOINT IS LOADED EVERYTHING CHANGES. NEITHER FORM NOR FORCE CLOSURE NOR SELF-BRACING CAN OCCUR WHEN THE JOINT IS LOADED WITH THE SUPERINCUMBENT WEIGHT. 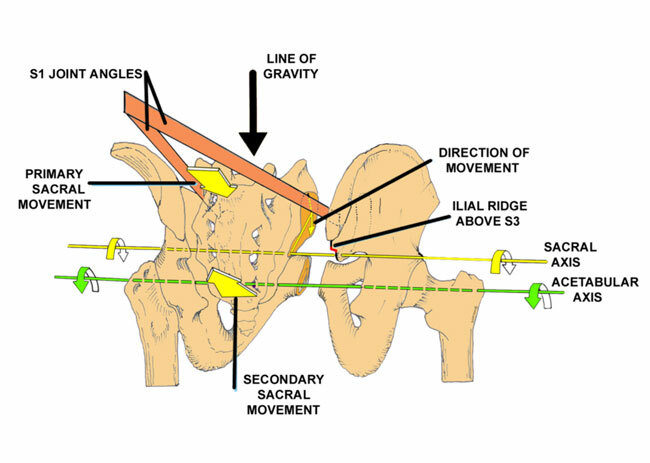 After loading, the line of gravity is anterior to the sacral axis, but posterior to the acetabula causing a posterior pelvic rotation and creating a dynamic, balanced tension on the pelvic ligaments. The posterior pelvic rotation decreases the lumbar lordosis and the lumbosacral angle. The sacroiliac joints are vulnerable to injury through minor and major trauma with an anterior shift in the line of gravity causing an anterior rotation of the innominate bones on the sacrum with a reversible subluxation and fixation. 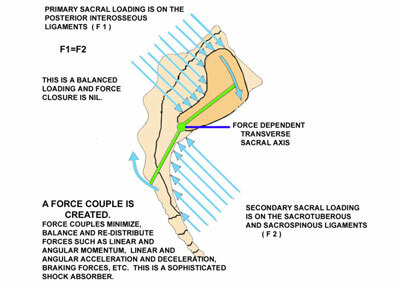 The opposing forces created when the ligaments are loaded create a force couple. 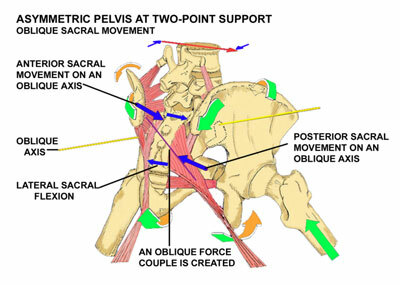 The moment created by the force couple creates a force-dependent transverse axis of rotation for the sacroiliac joints. 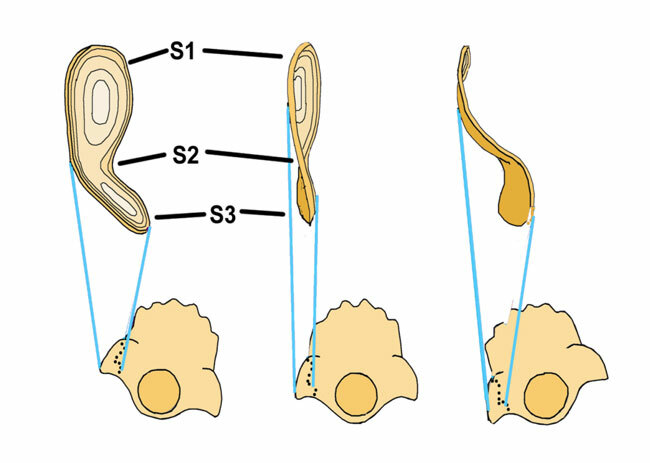 The weight of the superincumbent trunk anterior to the oblique sacral axis at S3 on the left causes a sacral movement anteriorly at S1 on the left and posteriorly at S3 on the right just as soon as the normal axis on the symmetric pelvis begins to move into asymmetry. The sacrotuberous ligament is helical and allows this movement. The longer the stride, the greater is the asymmetry, the greater is the lateral sacral flexion and thus the greater the sacral rotation on the oblique axis. An oblique force couple is created from the posterior interosseous ligament on the left to the sacrotuberous ligament on the right. 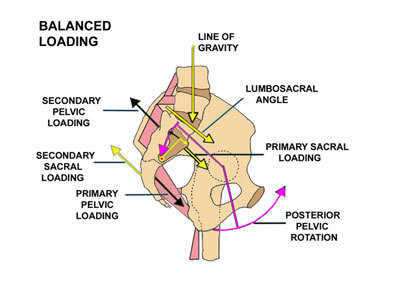 The sacral rotation drives trunk rotation toward the right (the side of loading), precedes the loading and serves to decrease the impact loading. 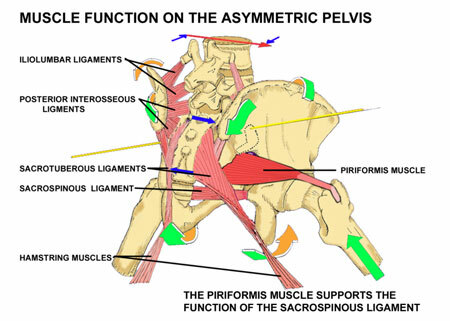 The piriformis muscle functions to support and assist the sacrospinous ligament in restoring the sacrum to its resting position as the pelvis moves to a position of symmetry at mid-step. 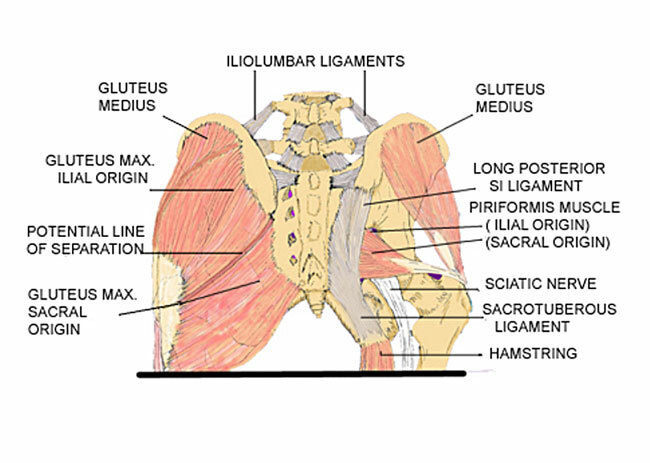 The sacral origin of the gluteus maximus serves to assist and support the function of the sacrotuberous ligament in bringing the distal sacrum anteriorly and laterally as the sacrum moves from lateral flexion to its resting position when the pelvis moves to symmetry at mid-step. This is necessary because the superincumbent weight is all anterior to the sacral axis and the sacrotuberous ligament is on stretch. The sacral origin of the gluteus maximus and the piriformis must act as prime movers on the sacroiliac joint when the pelvis is asymmetrical. 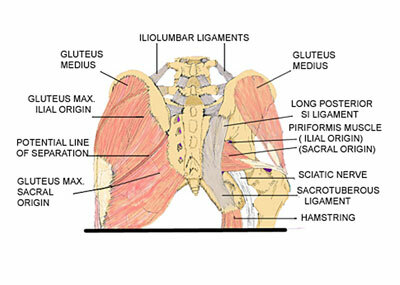 The sacral origin of the gluteus maximus also functions to pull the pelvis anteriorly over the loaded side until the leg is perpendicular at mid-step. The ilial origin of the gluteus maximus then undergoes an eccentric contraction to decrease the loading forces on the contralateral side. The biomechanical concepts I have described are consistent with current biotensegrity concepts. 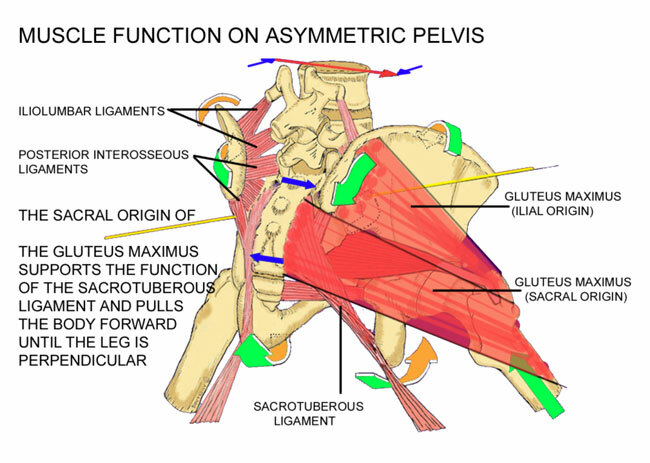 Dysfunction of the sacroiliac joint will cause at least some dysfunction in all of these pelvic axes. Other than when loading and moving from recumbent to standing, normal sacral movement occurs during normal gait. 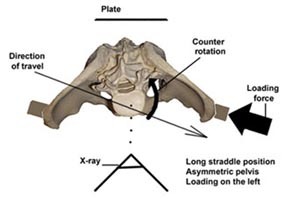 When the pelvis moves obliquely to the line of travel in order to extend the length of the stride it moves from a position of symmetry into asymmetry. This position with one leg in the extreme forward position and the other in the extreme back position is called the extreme long straddle position. 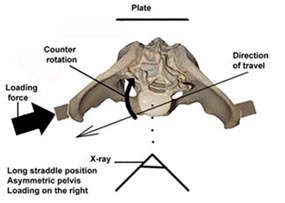 In this position the pelvic bone (innominate bone) on the side of the forward leg (the loading leg) rotates somewhat backward and downward on the sacrum while the pelvic bone on the side of the trailing leg rotates somewhat forward and upward. 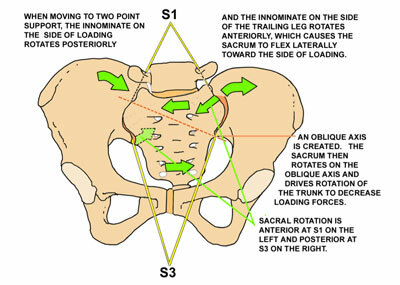 This movement on the sacrum causes the sacrum to flex laterally toward the side of loading. A force-dependent oblique axis of rotation is created. 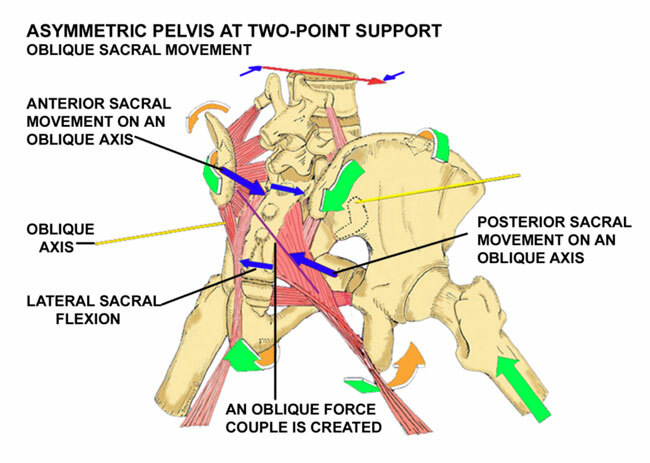 As the line of gravity is anterior to the sacral axis, the sacrum then moves on that oblique axis to drive counter rotation of the trunk on the loading side in order to decrease the loading forces and protect the head of the femur. This is a controlled instability and it can only occur with movement in the sacroiliac joint. Many practitioners believe that the sacroiliac joint does not move more than just a few degrees. Even though Smidt measured up to 30 degrees of motion with the patient in the long straddle position, as if taking a long step (1, 2). Sturesson measured a subject in the long straddle position and found movement in the sacroiliac joint of only about 5 degrees (3, 4). Most physicians accept Sturesson's measurements, which were extremely accurate. In examining the method used by Sturesson I found that he had made an inadvertent error in his positioning that was responsible for a substantial error in the amount of movement measured. 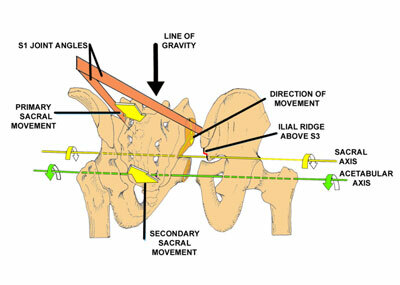 Most practitioners accept Sturesson's measurements as accurate, leading to the myth that the sacroiliac joint essentially has no movement and no important function. I have demonstrated this movement on x-ray and put it on this website rather than publish the information. Although publishing provides some stature it limits access to those professionals who may subscribe to any specific journal. X-rays taken of a pelvis in the long straddle position with counter rotation and with loading to the right and to the left. In order to view innominate movement on the oblique asymmetric pelvis it was necessary to have the front of the pelvis square to the camera, but oblique to the line of travel. Movement of the posterior superior iliac spines on the sacrum is obvious and much greater than reported. Clearly, there is ample movement at the sacroiliac joint and not minimal as is commonly believed. This position is clearly static. Dynamic movement would surely demonstrate greater movement than presently observed. Sturesson had the subject with the direction of travel straight into the camera and with the pelvis perpendicular. 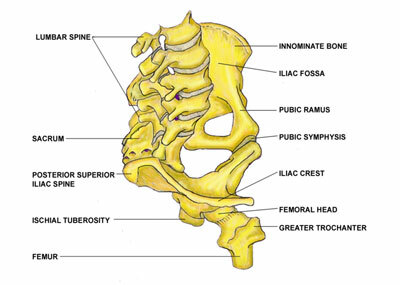 Sturesson did not have the pelvis in an oblique or asymmetrical position nor did he include counter rotation. Although his measurements were extremely accurate in this position he inadvertently measured some slight movement on the symmetrical pelvis rather than normal movement on the oblique pelvis with counter rotation. X-rays were taken of the subject in the long straddle position with loading on the right. The x-ray on the left is with the pelvis as per Sturesson, with travel toward the front, no asymmetry and no counter rotation. 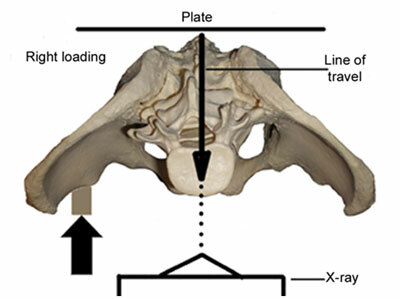 The one on the right is with the pelvis facing the x-ray, with the direction of travel oblique to the x-ray, the pelvis is asymmetrical and with counter rotation to the right. 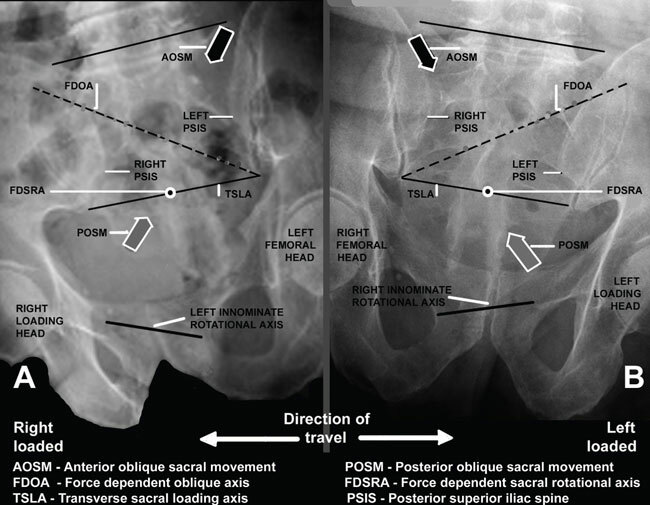 Conclusion: The sacroiliac joint demonstrates ample movement during normal ambulation when the pelvis is oblique to the line of travel and with counter rotation to the right and left. Thanks go to Eric Wilting and John Rosenbaum of the radiology department of Northern Montana Hospital for their expert assistance in this study. 2. Smidt GL. Innominate range of motion. In Vleeming A, Mooney V, Dorman T, Snijders C Stoeckart R, (eds) Movement Stability and Low Back Pain. The Essential Role of the Pelvis. Edinburgh, Churchill Livingstone, 1997: 187-1911.